Tourist cards are personalized temporary debit cards you can charge with any form of currency and use in any place that has a normal card reader anywhere within Iran. Card holders can withdraw any unspent amount of money left in the card after your visit. The Tourist Card is issued through Iran’s national banking network, Shetab. Who provides the Tourist Cards? 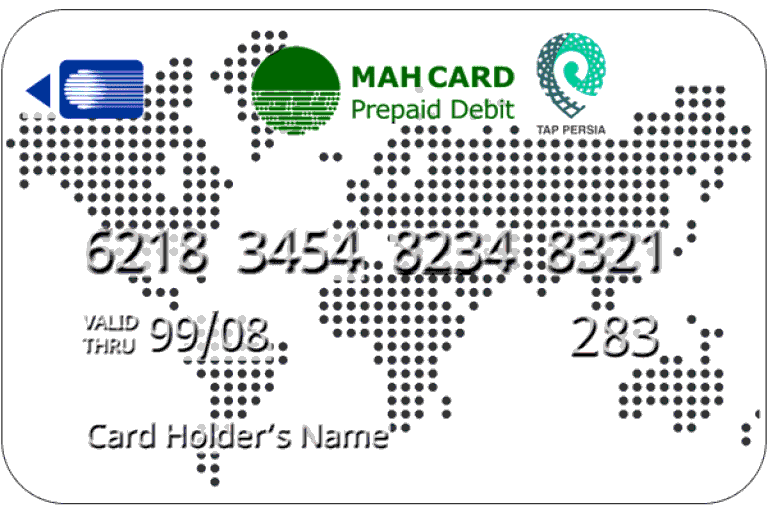 TAP Persia’s tourist card is provided by the startup Mah Card, in partnership one of Iran’s most credible and reputable banks. Additionally, all tourist cards, regardless of their partner bank, are connected to Iran’s national banking network, Shetab, and recognized by the Central Bank of Iran. How are Tourist Cards different from Gift Cards? Tourist Cards have many advantages over standard Gift Cards. Are credit cards such as Visa and Mastercard accepted in Iran? Unfortunately no. Due to numerous banking sanctions, international banking is problematic for those visiting Iran. Your tourist card aims to fix this problem by providing financial solutions so you can charge your card either within or outside of Iran. When and where can I receive my Tourist Card? After the successful submission of of your application, you will receive your Tourist Card in any location within the city of Tehran within 3 days. You can also have your Tourist Card mailed to you before your arrival. Shipping usually takes anywhere from 5-15 days and costs around 30-60 Euros for most European countries. If you wish to receive your card upon your arrival in Iran, click the Apply Now in the tab above to complete your application at least 3 days before your arrival. What are the subscription and annual fees? Each Tourist Card has a fixed fee of €19.00 to set up. Once purchased, the card is made active for the duration of your travel period to Iran. If you think you might be staying for more than 30 days, it’s better to let us know before your application submission. There are no cancellation fees. You may deactivate and dispose of the Tourist Card at any time. If any remaining balance is left in the card, you can withdraw the remainder in the form of Euros, Dollars or any other major currency by visiting the nearest exchange or by contacting our customer support. What is the exchange rate when I charge my Tourist Card? You can charge your card using Euros, Dollars or any currency of your choice. We will exchange your currency using the transfer day’s rate of exchange to Iranian Rials (IRR) and transfer it to the Tourist Card of your choice in real time. Can I add additional card holders to my account (i.e. family, friends, companions)? Due to safety reasons, there can be only one authorized user and PIN code for each Tourist Card. Your friends and companions would each have to get a Tourist Card of their own when they travel with you to Iran. If you are travelling with family, especially children, you can get a separate Tourist Card for each child 13 and over. Where can I use my Tourist Card? The use of card readers is extremely widespread in Iran. In urban and developed areas, almost every single business or service that offers something for sale will have a card reader. Although cash is always an option, people have gotten really tired of carrying exact change and most businesses actually prefer a quick and easy swipe of the card. More importantly, you will able to make online purchases. Booking tours, making reservations, buying plane/bus/train tickets and so much more become effortless. Can I withdraw cash from my Tourist Card? You can withdraw cash in Iranian Rials (IRR) from almost all ATM machines. Any time a building has the word “Bank” in the title, you can find at least one ATM machine. Since all ATM machines in Iran are connected to Iran’s Central banking network called SHETAB, it does not matter which bank you choose to withdraw from. Most importantly, all ATM machines are equipped with English commands. Simply select your preferred language after entering your PIN number. A bonus of the Tourist Card is that there are no withdrawal fees at any time. There is however, a cash withdrawl limit of 2,000,000 IRR (~ €20/$30) per day. You can check your recent transaction history and account balance at all ATM’s that are located infront of a building with the word “Bank” in the title. There are over 21 different banks in Iran, all of which are joined together by Iran’s Central Banking Network called SHETAB. How can I charge my Tourist Card if it runs out of money? You can charge your Tourist Card by paying with cash, paypal or bank transfer. All currencies received will be converted with the into Iranian Rials (IRR) and deposited into your personal Tourist Card. All currencies are accepted. You can purchase and charge your Tourist Card both within and outside of Iran. What happens if I have money left in my card at the end of my trip? We can exchange the remaining balance of your TAP Persia Tourist Card and transfer the funds to your PayPal account at any time. If you let us know about any outstanding balance in your card before your departure from Iran, we can give you the remainder of your balance in cash (Dollars or Euros). All you have to do is get your card over to one of our trusted representatives. If you leave Iran with a remaining balance on your TAP Perisa Toursit Card, you would have to send us a picture of the card along with some additional security details. Can I receive phone notifications/SMS/alerts about any transactions? The only way to receive phone notifications/SMS/alerts is by providing a Iranian phone number along with your application. All messages will be sent to the Iranian phone number you provide in your application. We highly recommend purchasing a cheap and reliable temporary SIM card, which you can also charge at any time using your Tourist Card. For more information, visit our helpful review of purchasing temporary SIM cards. What happens if I lose my TAP Persia Tourist Card? If you are certain that your cost has been lost or stolen, please call our customer service as soon as you can. We will handle the cancellation of your card and deliver a new card to you anywhere in Iran. Please note that renewal fees and delivery charges do apply.